ANOTHER MAJOR DRUM ROLL PLEASE . . . Here at Rossware, it’s our goal to do stupendous things, and on a frequent basis. Usually, we do pretty well via offerings produced totally “in house.” Sometimes, however, the most awesome stuff involves partnering with others. With this release, we announce a new partnership – with possibly the most awesome result yet. For background, over the last year a group of your peers (other retail-level servicers) pooled their financial resources to develop a new technology, and a new company to manage it. The company is Service Company Solutions, LLC. The technology is called MyPartsHelp. Quite simply, it links with ServiceDesk, and on the basis of a single click connects to each of your preferred vendors to inquire about pricing and availability on a given part (i.e., the part you clicked on, within ServiceDesk). It displays the result back to you inside of about one second. Really, you won’t believe how effective it is, until trying it. For each vendor, it not only shows if they have it; it shows how many they have, and at each of their locations. And it’s not the vendor’s standard/published price that’s shown; it’s your own particular account price. That’s not, remotely, all. Another click (and just a couple seconds more) shows you nationwide availability on the part. It does so by polling vendors from around the country. 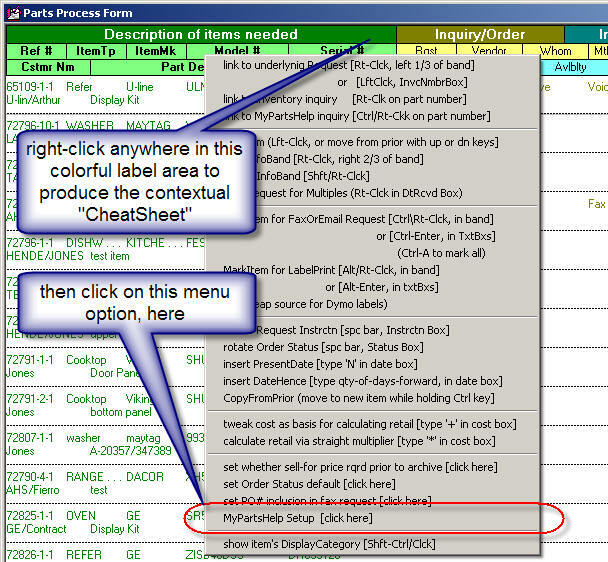 You won’t believe how often you’re able to find NLA parts or someone who’s stocking an otherwise backordered item – with just two clicks, and less than five seconds wait time. But it gets better still (do I sound like one of those TV ads?). You likely know about RepairClinic.com, and how when you lookup a part on that website you’re instantly provided with a set of very clear photos showing the part from several angles (dramatically helps to reduce mis-orders). Guess what. That same set of photos shows (along with everything else) in the MyPartsHelp, single-click lookup. On top of that, as one of your MyPartHelp membership benefits, you can order those can’t-possibly-get-anywhere-else parts at 15 percent off the price everyone else must pay. Do I sound like I’m excited to announce this product? I am (and, as in a few other instances, I apologize to those of you who are in fields other than appliances). On top of all the other good news, the MyPartsHelp service is downright cheap (about $20/month). Even better than that, it costs nothing to try (also, in a while it may also be available in the electronics field, and after that, who knows?). Oh, and did I say there’s more? There is. Right now you have the opportunity to get in on the ground floor. For a brief time only, MyPartsHelp accounts are being offered in beta (which is why the pricing is presently so low). Features are great already, but are destined to grow, and pricing may too. I suggest getting in while it’s cheap. Or, better yet, let ServiceDesk take you there. For this purpose, open your ServiceDesk PartsProcess form (Ctrl-F8), and right-click in the colorful label area at top to display its contextual "CheatSheet:"
Now pick the menu option labeled "MyPartsHelp Setup." This produces an option where you can choose either to link to the MyPartsHelp account setup page, or to enter your MyPartsHelp login credentials. First, of course, you'll need to do the account setup (after all, you'll have no login credentials until you do). After that's done, go back to the same venue -- only this time choose to enter your login credentials. Now, pat yourself on the back, and say Hurrah, because you're ready to use MyPartsHelp. Actual use could not be more simple, or require less work. Just do the normal stuff, that you'd normally do, within the ServiceDesk PartsProcess form (i.e., responding to internal requests to acquire parts that are not stocked, as displayed for you via line-item listings within that form). 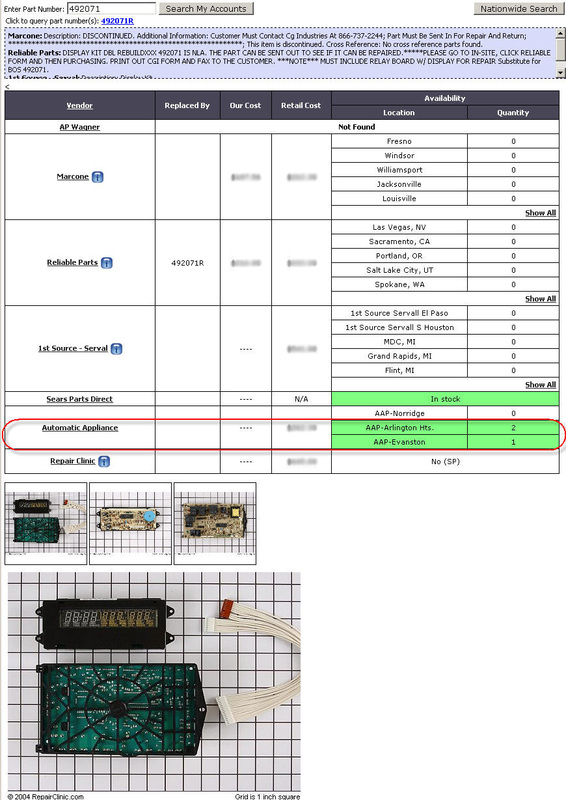 Only, when you're looking at any particular line-item (and with part number already determined and inserted), don't go to a vendor's website to ascertain availability and price. Don't call. Don't email or fax an inquiry. Instead, just do a simple Ctrl/Right-Click on the part number. That's all it takes, and -- inside of a second -- you'll see the magical result! This is an image capture -- from an actual, single-click display result (assuming particular vendors, as shown, where setup as those preferred, and with a particular servicer account number for each vendor, etc.). Actual pricing is blurred, because the actual page (as used for this image) showed pricing as specific to a particular servicer's account. Please notice, among other things, only Automatic Appliance has this part in stock -- a fact MyPartsHelp reveals inside of a second -- instead of forcing you to spend who-knows-how-much time making who-knows-how-many-telephone calls otherwise seeking to find it. Please notice, further, there's a "Nationwide Search" button in the top-right corner; if the initial display had not shown any vendor stocking it, the Nationwide Search would stand a good chance, still, of doing so. Finally, please notice it's only for your preferred-setup vendors that the system displays cost; MyPartsHelp is intended as a lookup tool only -- not as a price-shopping tool. Assuming you’re an appliance servicer, please, do not fail to do this. I feel certain you will love the service. It’s going to be great for your business.